Will Birmingham join the United Football League? Will Birmingham play in the United Football League? Rumors have been strong over the last six months that Birmingham could be one of the inaugural teams in the United Football League. Today, the UFL launched a campaign giving fans a voice in the selection of team markets and Birmingham is on the list of potential cities. The UFL is a new professional outdoor fall football league scheduled to debut in August 2008. The UFL has joined forces with TicketRESERVE to give fans the opportunity to purchase reservations for season tickets in an interactive web-based marketplace prior to the league’s official launch. The eight cities that generate the most ticket reservations will be designated as the leading markets to host a franchise. The campaign will focus on 12 potential host cities: Austin, Birmingham, Columbus, Las Vegas, Los Angeles, Louisville, Memphis, Oklahoma City, Orlando, Raleigh, Sacramento, and San Antonio. Fans can simply visit TicketRESERVE's website and pay an upfront cost to reserve their seats. Reservations are as low as $5 per ticket. Should their city get selected, the investment acts as a deposit directly towards their ticket purchase. If their city does not get awarded a UFL franchise, the money will be reimbursed. In addition to the TicketRESERVE reservation data, the UFL will consider market research and other factors in determining the final team markets. The UFL was developed to meet the unmet needs of football fans in major markets currently underserved by professional football. Featuring real, outdoor professional football played in the fall, the UFL will include eight teams comprised of world-class football players. Currently, games are planned for Friday nights. Bill Hambrecht, an investment banker and former investor in the United States Football League's Oakland Invaders, created the United Football League. Hambrecht has joined forces with an executive of Google, Tim Armstrong, and billionaire National Basketball Association's Dallas Mavericks franchise owner, Mark Cuban. Cuban offered up the following on his personal blog; "There is obviously demand for top level professional football. That is exactly what the UFL hopes to be someday, an equal of the NFL, if not more. There are a lot of markets that are bigger than some current NFL markets that do not have teams that would love to have a pro-football team. There are a lot of smart people involved in the UFL. It's a great TV product." Huyghue has a history with Birmingham. In 1991, he was the general manager of the Birmingham Fire of the World League of American Football. In 1992, he left the Fire for a position at the league office. An interesting wrinkle for the UFL to contend with is another new professional football league, the All American Football League, scheduled to begin playing in 2008 as well. Birmingham has already been granted a franchise in the AAFL and already has Legion Field under contract. "The biggest hurdle is pulling everything together in a relatively brief time frame. In terms of getting quality players, I don't anticipate that being a difficulty at all,” Huyghue said. Larry Langford, Birmingham's mayor-elect, announces that he will propose a 55,000-seat domed stadium to the City Council this week. According to Langford, that stadium would be a perfect place for a UFL team to play. Langford met with Huyghue this week to discuss the possibility of Birmingham being granted a franchise in the new league. Huyghue was in town to meet with the mayor and business leaders to gauge local interest and locate possible investors. "That's exactly the environment we want to be in. We'll make a decision in December. We're fairly close. Birmingham would be a great fit. I have firsthand knowledge of the community's passion and knowledge of pro football," Huyghue said. Huyghue said the league would be successful because each team will begin with an initial bankroll of $90 million. Estimates are for each team to spend $30 million each season. 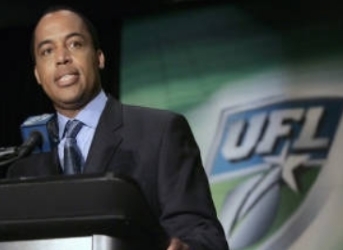 Mayor Langford believes the UFL gives Birmingham its best chance at major league professional sports. "Whatever the city has to do to make this league successful, I'll do it." Huyghue admits in an interview that the UFL will postpone their inaugural season to 2009 to attract more owner-investors, negotiate a television broadcast deal, and build league branding. The United Football League announce they will begin play in the fall of 2009, even though they only have four of the six investors they were hoping to have. Birmingham is not on the list of cities rumored as possible franchise locations. Hartford, Las Vegas, Los Angeles, New York, Orlando, and San Francisco are the current front-runners. The UFL also announced a new league logo. Despite not having all the investors they hoped to have to start the season, the United Football League decided to have a "soft launch" season and kicked off in 2009. The season was to be with less teams than hoped and with less games played, but all in the hopes of attracting other investors. Many feel that his hurt the league long-term, diminishing the league's stature to minor league. The league went on to play three more seasons. There was some team movement, while others folded or joined the league. In April of 2010 Mark Cuban loaned the league $5 million, despite him not owning a team or being involved in the league's operation. However, in January 2011 he sued the league in federal court for their failure to repay the loan. The league decided to change their schedule beginning with the 2011 season to August through October. However, in July they announced they would delay until the middle of September due to financial issues. On October 20, 2012, after four weeks of play, the United Football League ceased operations for 2012, hoping to continue the same season into the spring of 2013. However, the continuing financial difficulties and dramatically reduced attendance were too much to overcome and the UFL never returned.